You may still be able to book by calling the hotel at 49-40-369500. Comfort, style and grace can aptly be used to describe the Sofitel Hamburg Alter Wall. 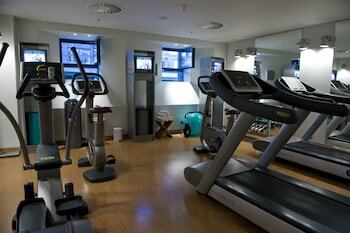 Located in the historic heart of Hamburg, the hotel blends old world charm with high tech, luxurious accommodations. Aside from convenient access to the many sights of Hamburg, you can revel in marble-laden bathrooms, 24-hour room service, and high-speed Internet access. Some of the rooms offer balconies, which look out over the Alster Canal. All guests, however, can unwind at the heated pool, sauna or solarium. For pleasure of the culinary kind, indulge in a meal at Ticino, a well-regarded restaurant featuring a range of different cuisines. 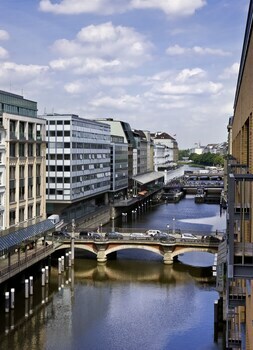 Sofitel Hamburg Alter Wall is a 5-star hotel located at Alter Wall 40, Hamburg, 20457, DE . Its nightly price usually falls between $151.14166666667 per night and $566.565 per night, excluding tax, depending on room category. $151 per night found for a Superior Room, View (Free WiFi) room type. Sofitel Hamburg Alter Wall sells rooms through sites like Room 77, Expedia, Hotels.com, GetARoom, and many others. Room 77 searches across dozens of different sites to find the lowest discount rates available. The lowest rate we've seen over the last few weeks was found on Room 77. In 1% of the cases we surveyed, all sites offered the same rate. You can compare real-time rates from all of these sites on Room 77. Room 77 is the only hotel shopping site that includes special discounts like AAA, senior, government, military, and corporate rates.